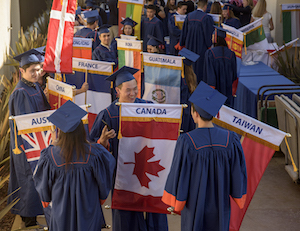 Pepperdine faculty, staff, students, alumni, and friends will gather together to celebrate the University’s annual Founder’s Day event at Firestone Fieldhouse in Malibu on Wednesday, September 20, at 10 AM. Declaring the opening of the 2017-2018 academic year, Founder’s Day commemorates the University's early beginnings and honors the vision of its founder, George Pepperdine. The ceremony will commence with an alumni processional and an invocation from Daniel A. Rodriguez, dean of the Seaver College Religion and Philosophy Division. Helen Easterling Williams, dean of the Graduate School of Education and Psychology, will deliver George Pepperdine’s 1937 Dedicatory Address, followed by a special message from Pepperdine University president Andrew K. Benton. The Pepperdine Symphony Orchestra and University Concert Choir will perform several musical selections, including the National Anthem and the University’s fight song.